The drug industry has come light-years from the days when pain was regarded as something to be grimly endured, rather than overcome. Treating everything from headaches to the agony of cancer has become a multibillion-dollar business. Yet many medicines sold to help the 50 million Americans suffering from one hurt or another have shortcomings that give companies such as Pain Therapeutics a huge opportunity. The South San Francisco company has two pain drugs in late-stage tests that could prove highly profitable if they get approval from the U.S. Food and Drug Administration. And they could give people relief from pain without having to worry about becoming addicted. Although some analysts are skeptical about one of the drugs, Oxytrex, Pain Therapeutic's founder and chief executive, Remi Barbier, is undeterred. He believes annual sales of the drug, which is formulated to eliminate the addictive qualities and withdrawal effects of opiate painkillers, could hit $1.5 billion. ``What Vioxx and Celebrex did for mild painkillers, that's exactly what we think Oxytrex can do for severe pain,'' Barbier said. He added, ``Of course, we're going to do it right, without all the mistakes of Vioxx and Celebrex,'' which have triggered hundreds of lawsuits over their alleged side effects. Opioids, such as morphine, long have been known to block the transmission of pain signals by nerve cells so the brain, in effect, doesn't sense pain. But scientists say repeated opioid use also can have a contradictory effect. They say it stimulates nerve cells in a way that makes them more sensitive to pain, so people need larger amounts of the opioid painkiller to feel its effect. That triggers withdrawal pains if they quit the drug. Based on work by researchers at Albert Einstein College of Medicine in New York, Pain Therapeutics claims adding a second ingredient, a so-called antagonist named naltrexone, avoids stimulating these nerve cells. This boosts the painkiller's potency, while lessening the patient's drug tolerance and withdrawal symptoms, the company says. When 719 patients with severe back pain took Oxytrex, half had less dependence and withdrawal symptoms than patients on the same opioid without naltrexone, Pain Therapeutics reported last year. But a second test of Oxytrex had to be suspended, the company said in November. In that test, Barbier said the FDA required patients be given a large dose of Oxytrex, without letting them gradually become accustomed to the drug. Consequently, many of the patients developed nausea or other unpleasant side effects that prompted them to quit the study. Barbier said the FDA has agreed to let Pain Therapeutics develop another test where patients won't risk getting such side effects. The company's other drug, Remoxy, has won enthusiastic reviews from some analysts and the company estimates its potential annual sales at $1 billion. It is designed to combat the growing problem of prescription drugs being diverted to addicts who then alter the pills to get euphoric highs. One drug that has been especially abused this way is OxyContin, a widely prescribed opioid for moderate-to-severe pain. About 4.4 million Americans used narcotic pain relievers for non-medical uses in 2004, the most recent data available, according to Leah Young, spokeswoman for the federal Substance Abuse and Mental Health Services Administration. Of those, 325,000 used OxyContin, she said, and growing numbers of opioid abusers are winding up in emergency rooms. Drug addicts can easily crush or otherwise break down time-release tablets of OxyContin into a form that can be snorted or injected for an intense high. 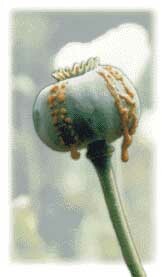 But Remoxy, which contains the same opioid as OxyContin, has a sticky composition that resists injecting or snorting. The company is counting on doctors taking their patients off other painkillers and putting them on Remoxy, if the drug is approved for sale, to lessen the likelihood of opioid abuse. King Pharmaceuticals of Tennessee is betting that will happen, too. It announced in November that it will kick in $400 million to help Pain Therapeutics develop Remoxy and other abuse-resistant painkillers. Under the deal, Pain Therapeutics gets 15 percent of the first $1 billion in Remoxy sales and 20 percent after that. Barbier hopes to win FDA approval for Remoxy in 2008. Some other companies, including Progenics Pharmaceuticals of New York, are developing opioid painkillers with naltrexone to ease constipation, another common side effect. But Pain Therapeutics seems to have few direct competitors, which is a plus with some analysts, though they tend to be more excited about Remoxy than Oxytrex. That was seconded by Dr. George Fulop, vice president of biotechnology and life sciences equity research for Needham & Company, who also owns no Pain Therapeutics stock. While agreeing with Pain Therapeutics that Remoxy ``is a billion-dollar potential drug,'' Fulop added, ``I'm more conservative with regard to assuming what Oxytrex can do.'' He pegged Oxytrex's likely sales at $150 million to $300 million, well below the company's estimate. However, Dr. Raymond Gaeta, director of Stanford Medical Center's pain management unit, sees a big need for Oxytrex and he praised Pain Therapeutics for the way the company developed it. ``They've really done some good science,'' he said. That's not to say it hasn't been a struggle for the company. Pain Therapeutics, which lost nearly $31 million last year, hasn't been profitable since it incorporated in May 1998. The company also had to discontinue work in December on another drug it developed for treating irritable bowel syndrome after the medicine failed to show enough benefit in a clinical test. But Barbier, who has worked at several other biotech companies, including Exelixis of South San Francisco, where he was chief operating officer, doesn't sound concerned. He said failure is to be expected in drug development, which he likened to ``looking for oil.'' He's already on the prowl for other products Pain Therapeutics can develop, including possible cancer treatments, and plans to add up to 10 people this year, bringing the company's workforce to about 50. But pain relief is the company's major focus for now.